It’s hunting season and the guys are ready have their boots and are ready for the great outdoors. There is really no other season that is so demanding for the appropriate wear because the season is going on rain, snow or shine. As varied as the temperatures and conditions are clothing must meet the same demands. This year, when the guys went scouting out the terrain for hunting and making sure their favorite trees were available, they tried out a new brand of boots that were only ankle high and super comfortable. The guys are after boots that are going to be rugged and durable, but they also make sure that they are comfortable after all hours upon hours and multiple days are spent in them! Lavishly live the great out doors and hunting out loud with me as we find Hi-Tech Hunting fashion for guys that are waterproof, rugged and comfortable. The boot the guys are reviewing this season repels water, are rugged, versatile, offer a foam-cushioned footbed, as well as a lightweight shank but only go up to the ankles. 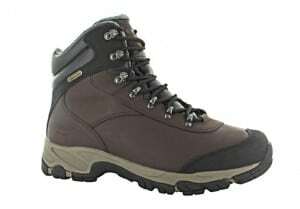 Outdoor boots are a special item and have to come from a company that gets the outdoors. The other important item with boots is the break-in factor, cause if you have to, it’s just not going to work. No one wants blisters or pain before trekking outdoor for the day after having been in the shoes for a few days. The Altitude V 200 i WP boot is quality leather, insulated and waterproof, but the great description does not stop there: Imagine stability in traction, like being on the side of a hill and being able to dig in, while still feeling comfortable in the shoe. My guys get in all the precarious situations from hiking up a hill backwards(hauling their hunted and wrangled game) to wading through streams, piles of leaf scud, deer droppings, and stones that just cluster their pathways, that they never saw because they got preoccupied tracking. These boots have them covered from toe to heel because the boot offers multi-directional traction on the rubber outsole which makes them great for rugged terrain. The Altitute V 200 i WP offers a waterproof full grain leather upper that then goes further and offers up Dri-tec waterproof bootie construction and a layer that is water repellent. As you know with hunting and anything outdoors there is bound to be water of some sort involved and the hardware on these boots will withstand the beating from the elements as it is rust proof. The tongue is gusseted keeping it comfortable and non-irritating, while the i-shield keeps the shoe dryer and cleaner, which means that your shoe will look newer even after it has been worn often. The favorite detail of the boot is the fact that once they popped it out of the box it was comfortable to wear without worry of breaking it in, which is not the norm for most boots, making this a keeper! Get ready for those days outside when hunting is a way of life and the boots that you walk in are the key to a successful day. Comfort, durability and amazing traction make the Altitude V 200 i WP perfect for those that love ankle high boots with water repellent capabilities.